So the judge must not follow the law, nor his conscience. He must not dismiss the case, or else there will be riots, mayhem, and murder. Additionally, judges are elected. That means he would lose all Black and some liberal votes, if he followed the law and acquitted. So he has no option then to send the case to a jury, costing hundreds of thousands of dollars to George Zimmermann, and the tax payer. The case would have to be moved somewhere where the jurors would feel they could decide either way without having to worry for their safety and the safety of their kids. I think right now, if a juror were to vote for an acquittal, they would have to be concerned about what the implications would be. Would the new black panther party put out a bounty on their lives and their family’s. The same applies to judges, too. As long as we live in a country where the black panther party can, with total impunity, put up a 10,000 bounty on George Zimmermann, dead or alive, judges and jury have to fear for their life, if they don’t convict. Equally, witnesses already are afraid. Blacks have special protection before the law. Whites have none. Add to this a president who interferes unjustly, and the press who consistently prints photos of 17 year old Trayvon 12 years old or younger, and accidentally edits the 911 call to make sure he is perceived as racist. ZIMMERMAN: This guy looks like he’s up to no good, or he’s on drugs or something. It’s raining, and he’s just walking around, looking about. 911 DISPATCHER: Okay, is this guy, is he white, black, or Hispanic? NBC’s edit destroyed Zimmerman’s life by building up a racial motive in what now looks like a self-defense killing. He now awaits trial because of that edit. It’s too much to hope that he can destroy NBC with this lawsuit, but here’s to hoping anyway. Dennis Baxley, a Republican state representative and co-author of the 2005 self-defense law, said Zimmerman negated his ability to claim immunity under the law by chasing Martin. "This law is for innocent, law-abiding citizens who are under attack by a perpetrator," Baxley told The Huffington Post. "Anyone who is out pursuing and confronting people is not protected by this statute." 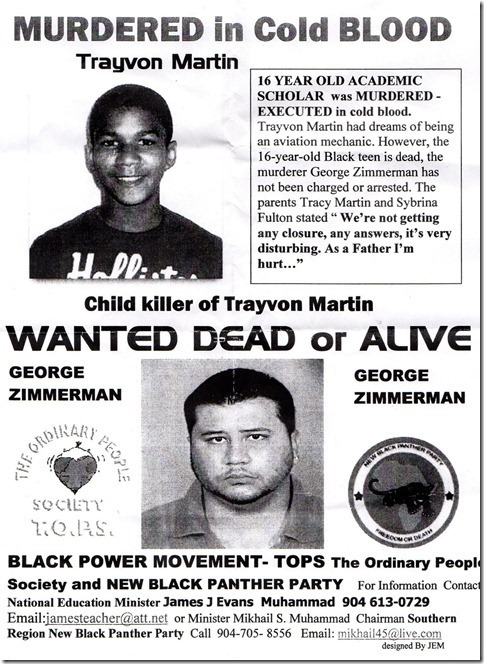 Any proof that George Zimmermann pursued and confronted Trayvon Martin? The state representative wants to win votes with the Black constituents. Especially where is the explanation for Zimmermann’s serious injuries to the back of his head, if all he did is to pursue and confront Trayvon? Self inflicted wounds? "I think they need to go back and read the statute," Baxley said, referring to the Sanford Police Department. Former Republican State Sen. Durell Peadon, another co-author of the law, said Zimmerman "has no protection under my law." "They need to prosecute whoever shot the kid," Peadon told the Miami Herald on Tuesday. Gun rights advocates also question the decision not to charge Zimmerman. "I don’t see why he hasn’t been arrested," said Sean Caranna, executive director of Florida Carry, a gun rights group. Zimmerman had no right to follow and confront Martin in the first place, Caranna noted. The judge said she would review Zimmerman’s medical records to see if they should be turned over to prosecutors. She will also take up an emergency motion filed Thursday by defense attorney Mark O’Mara that asks the court to grant depositions of several Sanford police officers, including former Chief Bill Lee. O’Mara said in the filing that he learned during a recent deposition of police Sgt. Joseph Santiago that investigators held several meetings in the weeks after the shooting and reached a consensus that Zimmerman should not be charged with a crime. Now, when is he going to sue ABC for the video they claimed showed no injuries? And how about the Black Panthers for threatening to kill him and cause him to be the object of a possible assassination by violent blacks? And, how about the crooked judge, Lester, who claimed Zimmerman was ready to run as an excuse to raise his bond to a million dollars, in spite of the fact that expecting a man to flee who is innocent and has such a strong case to prove his innocence is blatant kangaroo court politics. And the brutish, manish-looking Angela Corey who overcharged him with 2nd degree murder SOLELY to keep the black mobs from rioting? And there are many more culpable in this case. He has a better chance for monetary judgments than Richard Jewel had and Jewel collected from many biased news orgs who falsely reported on the story involving him. It’s time for the liberal geeks to pay for their lies and crimes. Zimmerman was charged in this case for legitimate self-defense strictly to keep the black mobs from rioting. That’s the ONLY reason. You gotta be kidding me with this woe is us white people attitude! How ignorant are you to assume the persistent mistreatment of people of ALL colors that has gone on for centuries would not lead to the type of incidents you describe, such as rioting and looting. I defend myself, I dont rob or steal or fight to gain monetary stature or power over my peers. To hear Whites crying their racist little hearts out because their own corruptness has now been imposed on their people as well as the minorities. Well gee, did you think your government really cares about what YOU think or feel? its been robbing and murdering YOU since it began? Here’s the world we have to live in, dominated by STUPIDITY mostly and where there is true intellect there also seems to dwell malice jealousy and greed. You don’t want change, or equality which is understandable considering the source, you in truth want slavery to be the norm once again. Well you have your wish, we by way of the actions and inactions of our forefathers are now enslaved to the very officials we have elected to office and the laws by which they rule. Yes, of course, it’s all the evil white man’s fault. So what university do you go to Matt? This comment of yours could have been lifted from any writing of any of Academia’s anti-white, anti-male bigots who make up the ‘Humanities Departments’ of today.